Many of us use our vehicles daily as a way to get to work, back home, go shopping, for visiting friends and family and the list of places we travel goes on and on. If your vehicle breaks down, it is usually a big inconvenience. Not only because you don’t have a ride but there is a cost to have a mechanic fix the issue that caused you to break down. 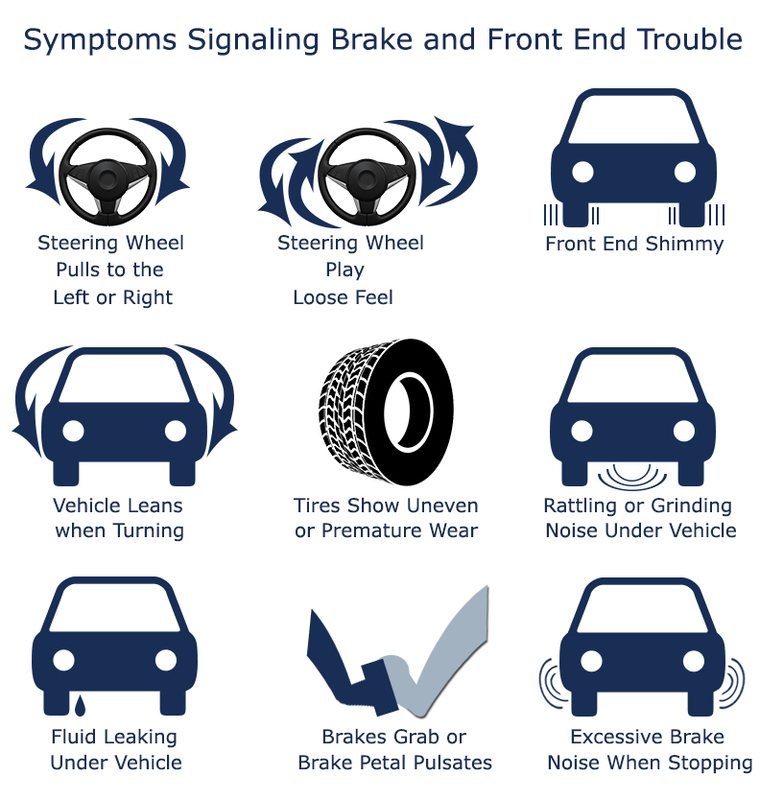 When it comes to your vehicle’s brakes and front end, there are signals that you should pay attention to and have checked as soon as you notice them occurring. Often, when you notice a new sound or feel something different with your vehicle and you do nothing until your vehicle breaks down, the cost will usually be much more than if you had it checked right away. Here are signals that can alert you to a possible problem. Grinding, screeching and rubbing – Brake pads and brake shoes may need to be replaced because if you wait, they can wear through and damage other parts of your brake system. This will cost much more than just replacing brake pads and shoes. Steering wheel vibrating – This can be caused by metal on metal rubbing of brake rotors and needs to be checked out asap! Play in or loose feeling steering wheel – Could be any of a number of things including worn tie rod ends. Fluid leaking – Just like our bodies need fluids to keep us running, your vehicle has fluids it needs to run efficiently. There are many different reasons for fluid to leak from your vehicle but anti freeze/coolant is one of the most common fluids that is found when there is a leak. If you notice any fluid or coolant leaking from your vehicle, take it to an auto shop right away to help avoid your vehicle overheating. Vehicle leaning to one side when turning – This can be caused by any of a number of reasons the most common include, a binding shock absorber or strut, a bad spring or torsion bar, bent suspension parts or a twisted chassis. Regular vehicle maintenance will often catch problems in the early stages which will usually cost less to repair than waiting until the problem becomes much worse. Also, you want a safe vehicle to drive and there are parts that if they wear or break, can cause your vehicle to become a safety hazard for you to drive. AAMCO of Bonita Springs is a NAPA Auto and Truck Service Center. AAMCO of Bonita Springs offers a NAPA nationwide warranty that covers parts and labor on qualifying repairs and services for 24 Months/24,000 Miles. Quality auto and truck maintenance and repair for your car or truck at reasonable prices. Schedule an appointment.